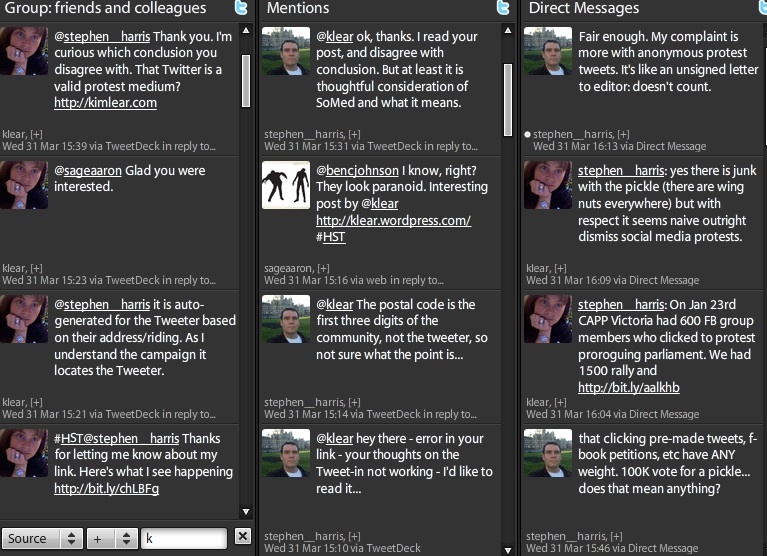 I met Stephen Harris, Manager of the BC Gov’t Caucus Communications on Twitter this week. We debated the efficacy of online protest actions through tweets, and direct messages. Our debate ended when he said, after being on Twitter all day, that in his opinion a message tweeted in protest by a constituent to an elected official “doesn’t count”. But maybe I should back up. This all started with the NDP launch of the Stop HST Twitter Protest Wednesday morning. I wrote a post Calling All Tweeters to Stop HST and I tweeted a little about the campaign design/implementation. A couple of hours later I searched the Twittershpere for HST activity to monitor the success of the campaign. That’s when I saw a tweet by stephen_harris, which seemed to intentionally misrepresent the protest efforts. I called him on it by replying to his post on Twitter and sent out a link to what I had blogged about his tweets in my article Politicians: stop dismissing online communication. His first complaint about the campaign was that Tweeters were misrepresenting themselves as constituents when they tweeted to multiple MLAs. Aside from the fact that people can protest to any MLA, not just the one representing their constituency, he didn’t realize that many of the tweets were tagged with the first 3 digits of the Tweeter’s postal code. I explained that I understood that to be a transparent design feature of the campaign because it allowed for the MLAs to know how many of the tweets they received were actually voter-to-elected-official communications, and how many were general protest tweets. His first DM suggested that he was questioning whether online protests meant anything. I respect a man who asks a thoughtful question – we need more people asking more questions. I replied by giving him the example of the success of the January 23 protests over Stephen Harper’s decision to prorogue Parliament. Here in Victoria, we had about 600 people click to join our facebook group. 1,500 showed up to rally in person. And as a direct result of the people across Canada clicking buttons, and getting out to protest, the NDP passed a bill to limit the powers of the PMO. Given that example, I respectfully pointed out that it would be naive of him to dismiss all online protests. That’s when he lost me. I understand why an unsigned letter to the editor doesn’t count. But the MLAs are not receiving anonymous tweets. The majority of tweets in the Twittersphere link readers to the Tweeter’s name, and in many cases a bio and website address are available. Yes there are people who set up Twitter accounts under pseudonyms, and there are people who use an x to sign a petition, but the majority use their real name. The argument could be made that protest tweets are very much like letters to the editor, in that some are personally crafted by an identified author, some are written on behalf of multiple people and broadcast to multiple news outlets, and a minority are written by people who refuse – for whatever reason – to reveal their identity. So, Mr. Harris can quite rightly compare protest tweets that are sent by Tweeters who don’t disclose their identity, to unsigned letters to the editor, but it is fallacious and incendiary to compare all protest tweets with unsigned letters. Unless when he was a newspaper editor, he dismissed all letters to the editor because a few came in unsigned, I don’t see how he can now rationalize dismissing all the protest tweets that came out of this campaign. So I’m still having trouble with his statement that a protest tweet “doesn’t count”. He said that he doesn’t like that they are anonymous. They aren’t, or at least the majority are not. He said that he doesn’t like that the Tweeters are misrepresenting themselves as voters. They aren’t. The postal code hash tag makes it easy for MLAs to know if the Tweeter can vote for them. He’s referred to the message as SPAM. It isn’t. The Canadian government defines SPAM as “unsolicited commercial e-mail“. Protesting the HST is not a commercial act. He didn’t seem to like that a campaign tool gave protesters a crafted message to tweet. But again that’s no different from Amnesty International giving people a form letter to mail. Is it reasonable to think that perhaps he has a problem with the protest message and that he’s taking it out on the protest medium? Times are changing. People aren’t just writing letters to the editor, sitting in and carrying signs on the street. They are doing all of that and they are blogging, holding tweet-ins, and creating facebook pages. Dude, I have a megaphone. A lot of people do now. Politicians and their support staff need to understand that the people with whom they are communicating can go out in the world and communicate en masse these days. Here’s my final thought. The fact that I can open my lap top and enter into a debate with the Manager of BC Gov’t Caucus Communications is a sign of the times. He’s not in my circle of friends, I’m nowhere near his circle of influencers, and yet there we were, sharing time and ideas via social media. Could I get a meeting with him? No. Could I get his attention for an afternoon. Yes. That alone makes me think Twitter protests count for something. What do you think? I read these DM posts a little differently than you did. Harris specifically dismisses the anonymous tweets and puts slactivism in perspective. Is it really so impressive that over 200k fb accounts joined CAPP when you consider that over 60k joined the Petition to Remove the Communist Regime of B Hussein Obama? I read this as Harris diminishing the magnitude of SoMed’s impact at this point, not dismissing SoMed completely. As you point out, Kim, he’s gotta believe a little bit or he wouldn’t take the time to use it or interact directly with other users. The 1 tweet = 1 vote equation is far from being achieved.